January | 2013 | One woman. Many bicycles. Back in 2008, while Jill Kintner was flying toward Bronze in BMX at the Olympics, I was barely edging out the 5-year olds at Calabazas Park. I stumbled upon this post I wrote for my friend Bev’s blog back then, long before I dreamed I would have my own blog. So long ago, but nothing’s really changed. My friends still push me. Occasionally, I let my curiosity trump my dignity. When I told Beverly and my buddy Jill that yes, I’d try this pump track thing, it seemed like a good idea. So I threw my flat pedals on my mountain bike, grabbed my skate shoes and drove down to Calabazas Park, feeling confident ’cause I knew my friends would be there. But when I rolled up to the BMX area, filled with guys of all ages and sizes, flying across the jumps and doing acrobatic moves, I almost said it out loud: “There’s NO WAY I’m going in there.” I felt conspicuous enough just riding down the sidewalk looking for the Strong Light and Beautiful (SLaB) gals. I found Beverly and her friend Cindy with the camera. The Channel 11 news truck was just leaving and the young BMXers were out in force, checking out the media attention and checking out the “old ladies” who ventured near their play zone. Before long, Jill and Elizabeth showed up, as did a few other SLaB women. Two saw the scene and immediately turned tail, claiming to be on their way to Fremont Older. But Joann, a 50+ beginner, pushed herself out of her comfort zone and stayed for the ride. You go girl! After Bev’s friend Shane from Evolution Bike Shop arrived, it was time to ENTER THE PEN. Elizabeth suggested we get away from the crowd and warm up on the berms on the other end of the park. So we rode past the youthful eyes, attempting to find some privacy. We didn’t expect the boys would follow us to watch. Despite the unwanted attention, the berms were great. You’d come down a tabletop, swoop one way then the other in a series of links. Shane had some suggestions: bend your elbows more, put your weight here, push here, lift there, but I was content just to see if I could get through the series without pedaling too much or having to brake. A good start. Then it was time to go back to the main area for the rollers. More instruction: bend your arms on the upside, push down with your legs on the backside. Or was it something else? I forget. The idea was to pedal as little as possible, but I was once again content just to not stall out on top of the rollers. We played until it started to get dark, and then talked until it got really dark. Oh, and we took a photo with all the BMXers for Jill Kintner. I’m sure the good vibes we sent helped her in the race. What impressed me most about the BMX park was the healthy, safe environment it provides for the risk-taking that comes with youth (and for some doesn’t end at youth). Every neighborhood should have such a place. So while I’m not going to buy a BMX bike anytime soon, or seek out time at a pump track, in the end I was glad I came. I got to try something new, I got to support an American female athlete in a sport dominated by males, and I got to visit a new bicycling culture. Go Jill Kintner. Go BMX. Go Olympics for recognizing this sport. Go Bev and SLaB for organizing a great event. How do you push yourself outside of your comfort zone? Does it come from within or do you need a nudge? Note: Photos in this post courtesy of SLaB. When the sky is gray, day after day, and rainstorms soften to drizzle, all you need to lift your spirits is an outfit with some sizzle. A trench coat in red, a zebra-print shirtdress and shiny black vinyl boots kept me dry, clean and comfy as I rolled through puddles on the river trail with a chorus of happy ducks as my soundtrack. Wearing bold colors and strong patterns on a gray day makes everything a bit brighter. Black vinyl boots wipe off much faster than wiping down my white bike. A light raincoat and quick-drying gloves are all that’s needed for light rain. A polka dot seat cover keeps my leather saddle dry and clean too. My commute on Tuesday had me waiting on the wrong-way Caltrain platform with a zone upgrade in hand. 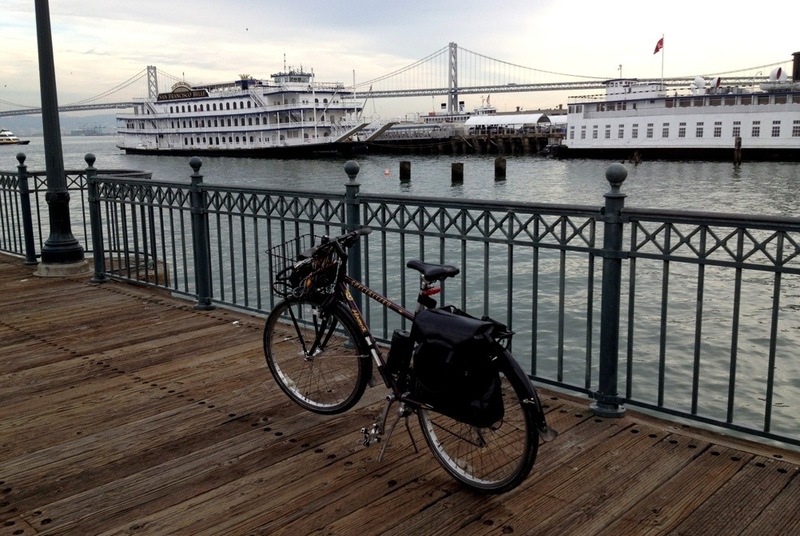 In 45 minutes I was in San Francisco, pedaling up the Embarcadero for a business meeting at our advertising agency. I locked my bike to a rack on the street in full view of our conference room and walked inside. During my meeting, three employees in this small shop rolled in on their bikes, and I met the agency president who commutes by skateboard. After the meeting I rode back to Caltrain, and left my heart in San Francisco. I had a co-worker who told me he chose Purdue University not just because of its outstanding engineering program, but because there was nothing to do in small town Indiana. He said if he went to school somewhere like University of California Santa Barbara, he’d spend all his time at the beach instead of studying. He’d probably say the same thing about UC Santa Cruz, which has awesome surfing just minutes south of campus and amazing mountain bike trails just minutes north of campus. He’d probably never make it to class. The trails on university and state property just uphill from UCSC campus are among the best in the region, in the region where mountain biking was born. Find a local to show you around, perhaps someone who works at Santa Cruz Bicycles or at Giro. 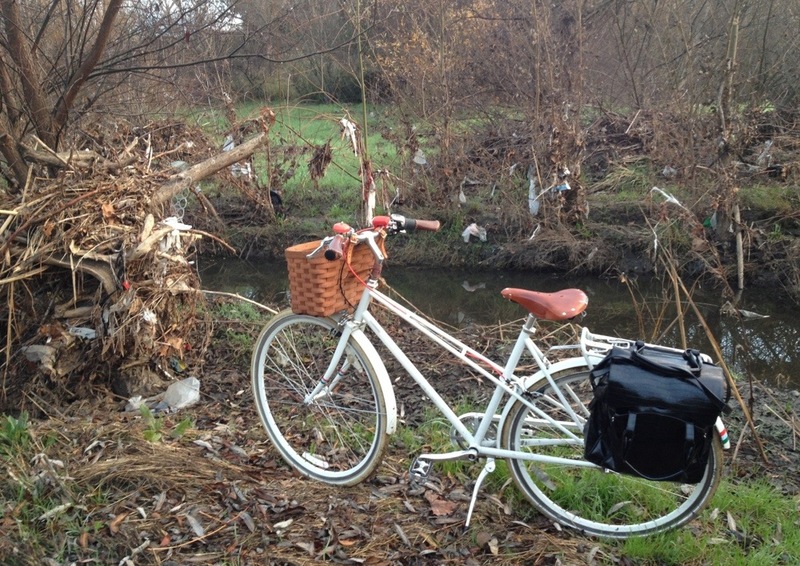 It’s a favorite morning or lunchtime ride spot for those lucky folks. You’ll want a local because the best trails may be named, but they’re not marked. With trails this good you don’t want to advertise them to the teeming masses. I’d offer to show you myself, but I have no clue where we rode. All I can say is that it’s an amazing, magical forest. And it’s a good thing I don’t have to study or work nearby. Do you have a special riding place in your area that locals keep under wraps? How did you learn about it? For more information: Trail maps are here. Organized rides available through Mountain Bikers of Santa Cruz. Bored with weeks of frosty mornings and wool sweater dresses, I threw caution into the chilly wind and zipped off in this sleek navy blue sheath today. 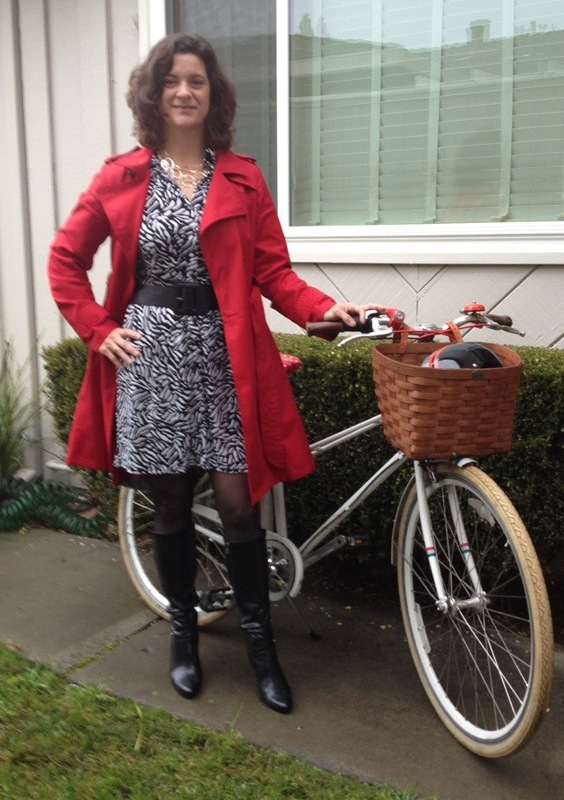 My heavy coat, tights and suede boots kept me comfy on the bike, despite the shorter hemline and sleeves on this versatile three season dress. How many days until Spring? I associate navy blues with spring. This year a soft navy is the official Pantone Color for Spring 2013. Note to self: When the tights go out of season, wear bike shorts underneath. Shell jewelry says June, not January, but I don’t care. When drivers complain about the ways bikes annoy them, “blocking traffic” comes up pretty high on the list. After all, bikes can’t travel as fast as cars, and sometimes cars have to slow down and wait to pass. But in parking lots or on congested streets, I find the road boulders are the vehicles with four wheels, not two.